Bully prevention is a hot button topic in education, and with good reason. It’s estimated that more than a quarter of students have experienced bullying, while up to 30% of students admit to bullying others. More than 70% of students and educators alike have seen bullying in their schools. Addressing bullying behaviors in an educational setting is no small task. Helping students to develop positive behaviors can change the attitudes and actions that lead to bullying. 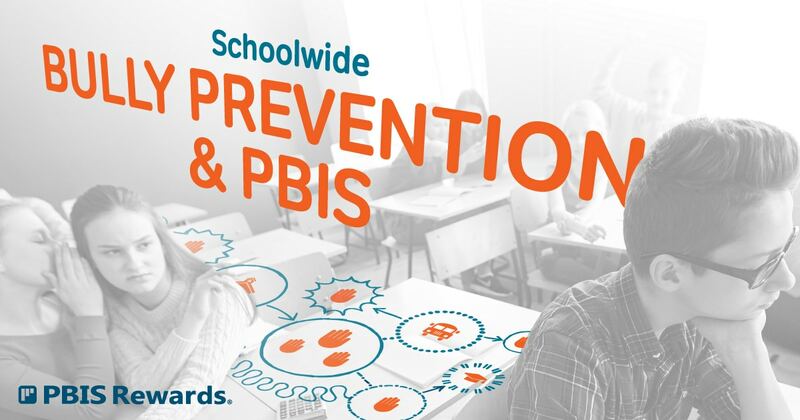 Adding schoolwide bully prevention to your PBIS initiative can help your school do just that. Anti-bullying programs work well when they are implemented schoolwide. If your school is implementing PBIS, you already have the elements in place to affect bullying in a positive way. How can PBIS dovetail with an anti-bullying strategy? When your school works to identify positive behavioral goals, it’s already halfway there in combatting bullying. Establishing a PBIS initiative schoolwide helps to focus students and teachers alike on positive behaviors. These expectations create a different climate in the school, one that leaves very little room for bullying behaviors. Bullying behaviors are sometimes the result of inadequate character education. Implementing social and emotional learning as part of your PBIS initiative can help students to develop strong, positive character traits. It also helps them to name bullying when they see it. Teaching response strategies for bullying behavior – for bully, victim, and bystander – helps to stop bullying behaviors. Professional development is a way of life for educators. For many, ongoing learning happens on their own time and at their own pace. Schools using a PBIS initiative provide professional development that supports their behavioral goals. Often, though, educators can’t clearly define bullying or effectively help the students involved. Including anti-bullying training in professional development can benefit the PBIS initiative, as well. Progress monitoring your PBIS program helps you to determine what’s working and what needs adjustment. Tracking interventions and referrals will give you an accurate snapshot of areas that need work, and can help you identify bullying much more quickly. Of course, tracking and analyzing PBIS data is easier when you have everything updated in real time. Bully prevention within a PBIS initiative can be powerful. Because you are already focusing on positive behaviors, bully prevention is a natural fit. Providing teachers with the tools to recognize bullying behaviors helps to stop such actions before they become widespread. Teaching students how to react to bullying, no matter their role, can effectively reduce bullying behaviors. It’s important to note, however, that bullying prevention programs can’t take the place of a PBIS initiative when it comes to improving school climate. Rather, bullying prevention can be a significant part of your PBIS initiative, which has the potential to change your school’s climate for the better. Need help making your PBIS initiative the best it can be? Consider a digital token economy. PBIS Rewards can help you take your PBIS initiative to the next level with easy administration, simple points redemption, and detailed data collection. Contact us to learn more!